Not quite the romantic swan boat for two that I've always heard about though. With two lovely benches!.. The swan's a little "kitsch"!I wonder how the boat is moving?.. Not quite so much of that Boston sunshine in this one. Grey and cold here near London. Looks as if you caught boats moving in two directions. And that other had a load of passengers, even if the weather wasn't ideal. I've never seen a boat so original! I'll bet the girls swoon if their lover takes them for a ride on this beautiful swan boat! My compliments regarding the benches, but I must say I found the swan somewhat out of its right water, so to speak. Hi Clueless! I'm finally back to blogging again. I've missed being online. It's strange... I see more of Boston through your blog than when I'm around the corner from the actual city! This is a unique angle capture of the Swan Boats. How neat! 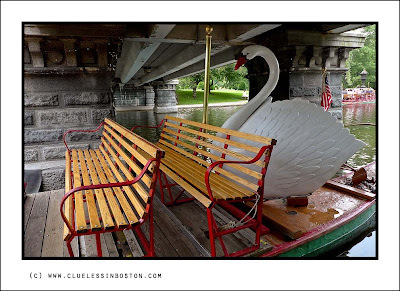 I missed seeing it when you originally posted it but I love the swan boat with its benches!